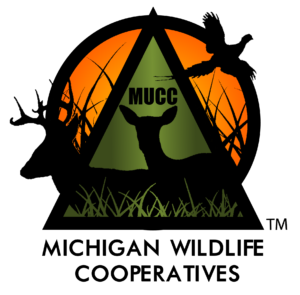 The Michigan Wildlife Cooperatives program was created to assist in the creation and enhancement of wildlife cooperatives in Michigan. This program is available to provide support through networking individuals, providing resources and information, and assistance to fund habitat work within cooperative properties. If you want to improve habitat, hunting, and neighbor relationships, you are a great candidate for starting up a wildlife cooperative in your area! Social engagement. Being able to share hunting stories and experiences is key to increasing satisfaction. Having an organized cooperative allows for these conversations to occur, and facilitates conversations oriented around how to improve hunting conditions in your area. Landscape level management. A single landowner has a pretty good idea what activity and habitat look like on their property. However, most wildlife has a range greater than the average parcel size. Having a wildlife cooperative will allow landowners to talk about their properties in the context of a greater whole, enabling the group to get a better feel for what is happening from a broad perspective and with combined data. Shared resources. Once some relationships have been established within a cooperative, neighbors may be more likely to share resources that they are in possession of. For example, if a farmer has a till, they may be willing to let others in the cooperative use it. Another option would be to chip in with a couple neighbors and rent any needed equipment. Cooperative members can also work on each other’s habitat projects, increasing the enjoyment of work by sharing it with others. Greater access to support. There are many good speakers, experts, authors, etc. who are interested in sharing their knowledge with fellow hunters. Having a cooperative of active participants will provide some leverage and increased interest in these types of people coming out to cooperative meetings and presenting on their area of expertise. These resources are valuable in helping your cooperative grow in knowledge and skills. For information on Pollinator Habitat and the Pollinator Habitat Designation Program, click here. A Deer Browse Seminar was held to help equip cooperatives to better manage their deer herd. Background was provided on deer populations, habitat ecology, and plant identification. With this information, a process can be used to evaluate deer browse in a wooded area to determine if deer densities are too high. Some helpful resources are available below, including the recordings of the training. Click here to download the directions and form for the Deer Browse Survey.